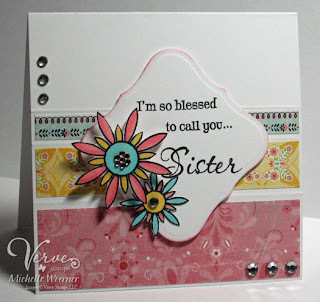 Verve Stamps: Project Parade Day 8: It's a Girl Thing! Project Parade Day 8: It's a Girl Thing! Hi everyone, it's Michelle! Welcome to Day 8 of this month's project parade. I have sooo been loving all the projects the Divas have shown so far, haven't they been amazing?!? I love the idea of doing a project to honor the women in our lives. I chose to make a project for my sister! She is my best friend and my rock. I am lucky enough to live 4 miles away from her and what a blessing that is. 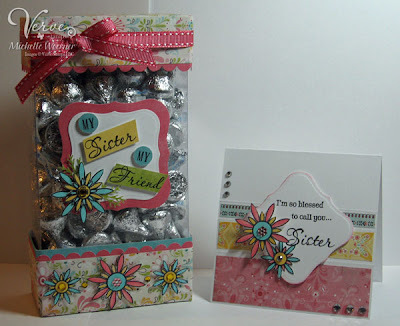 It was fun to make a little something for her with these rockin' new stamps this month. I went with something that had bright and fun colors. Recognize my candy box? It is actually a Prima Essentials box that I covered over. I was all set to make a box with acetate and instructions off SCS, then seriously, I looked in my recycle bin and there it was -my empty prima box!! I covered the bottom and top with Basic Grey Urban Prairie DP. All the flowers are from the Wishful Elegance set. I love, love, and I mean LOVE these starburst shaped flowers. They are fun to color and very easy to cut out. I used copic markers to color them and all the centers have some rhinestone bling in them. The sentiment on both the card and the box are from Because of You. 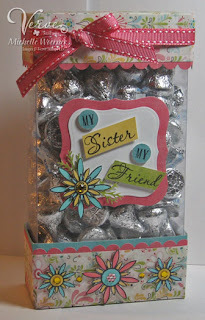 Don't these Hershey's Kisses look yummy? Confession, I have eaten 4 since I started typing this post! LOL! Here is the little card I made to coordinate. It measures 4 1/4" square. It's hard to see in the picture, but there are scored lines in between each DP panel. I think it adds just the right amount of umph! Would you like to play along with us? Just make a project or card that fits your style and celebrates a woman in your life. It can be any woman ... mom, grandmother, daughter, sister, aunt, friend, teacher - you get the idea! Just add your project link to the Mr. Linky form IN THIS POST before 8PM Mountain on Thursday, May 14th. Two random participants will be chosen and win $25 gift certificates to the Verve Store. Have fun and good luck!